Joe Luwi put Koloale in front after 18 minutes from a corner kick that was allowed to freely sail into the back of the net but Tony Otini cancelled it out within 7 minutes with a header to a cross from the far side. 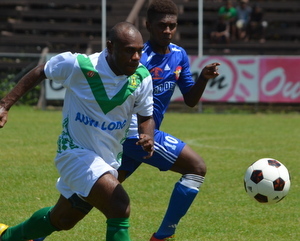 Koloale were in front again in the 38th minute with another Luwi strike. The Solomon Islands beach soccer international was in a great position when a flat pass came cross to him and all it needed was a push in the right direction. X-Beam returned from the break determined to get something out from the game and they found their equaliser through defender Arnold Keni who headed home an uncleared cross in the Koloale penalty box. Joses Nawo then gave X-Beam the lead for the first tie from the penalty spot after he was fouled inside the box in the 71st minute. With time fast running out Koloale needed something special to not miss out completely on the spoils of the match and it was Paul Wale who provided. Wale was forty yards out when he saw the X-Beam goalkeeper of his line and he fired a shot that swung over the defenders and dipped into the net. This was a must win encounter for both clubs and Koloale would have moved to within two points of Solomon Warriors had they won. This is putting Koloale coach, Gideon Omokirio under pressure with KOSSA and Western United hot behind their heels. Koloale has now tallied 20 points from 11 matches on the back of 5 wins and 5 draws with only a single loss this season.